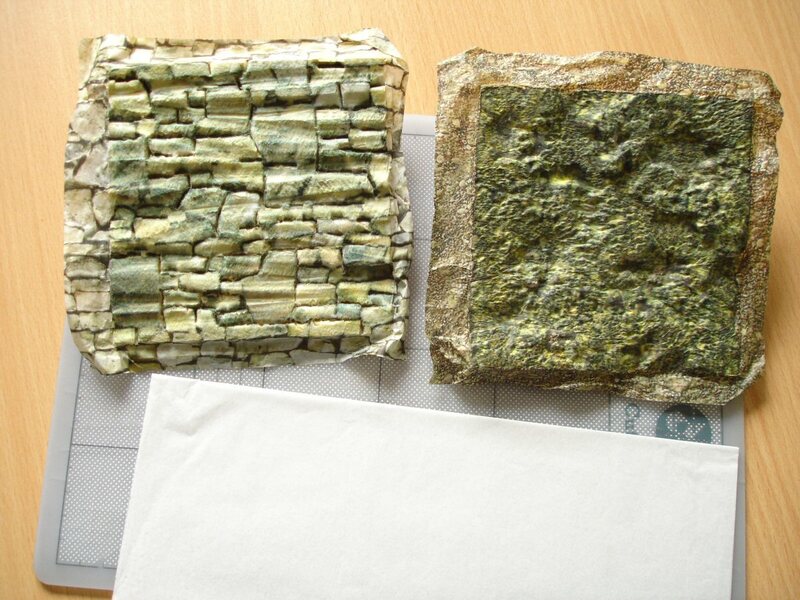 Last year I developed a short session for Central Saint Martins students looking at various ways of using printed images to assist in the making of realistic, physical models. 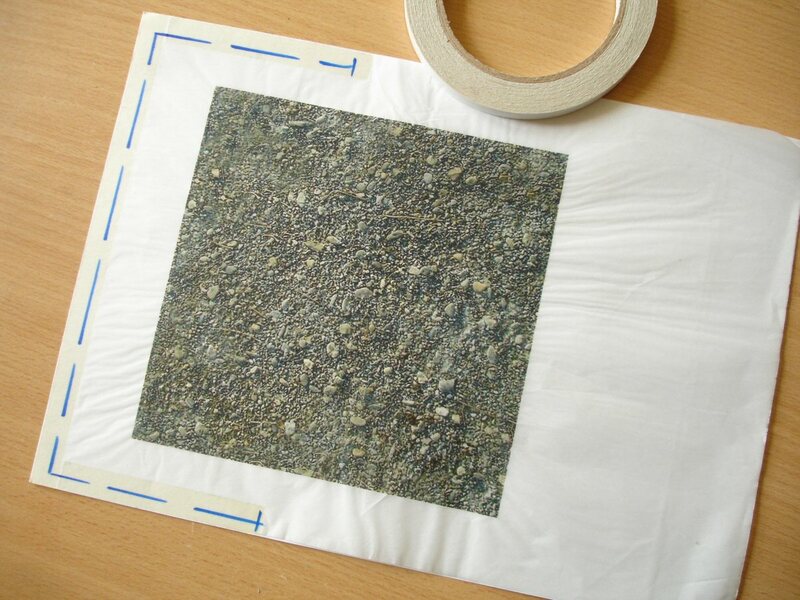 I had particularly wanted to explain the steps necessary for making scaled wallpaper or carpet patterns, for example, but I also wanted to show what could be achieved using photographed surfaces. I’m due to give the session again for this year’s students but I’ve also been looking at similar techniques with Wimbledon College of Art students so I thought this was the best time to write it all up here. 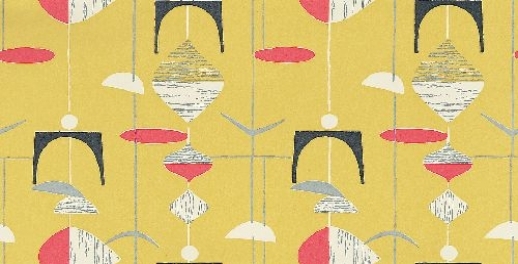 It’s much easier to use or modify a pattern found on the Internet. Quite apart from having an almost unlimited choice, one can often locate the all-important pattern ’tile’, that is, the properly cropped portion needed for seamless repetition. One should be aware of possible copyright laws when overtly using an owned pattern, but I think it’s also accepted that unless the pattern is being used in a commercial context there should be no reasonable cause for concern. 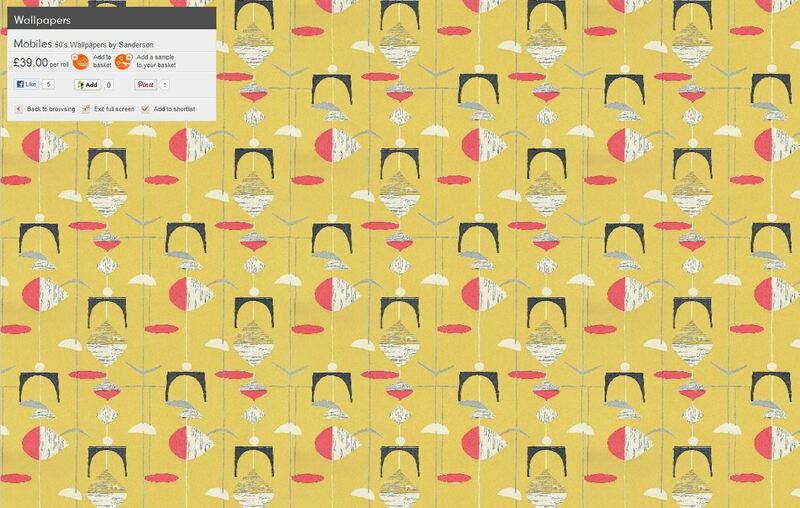 The most obvious source of wallpaper patterns is a wallpaper manufacturer’s or seller’s website. Some make it easy to lift a repeatable pattern, others a little more difficult and some not at all. 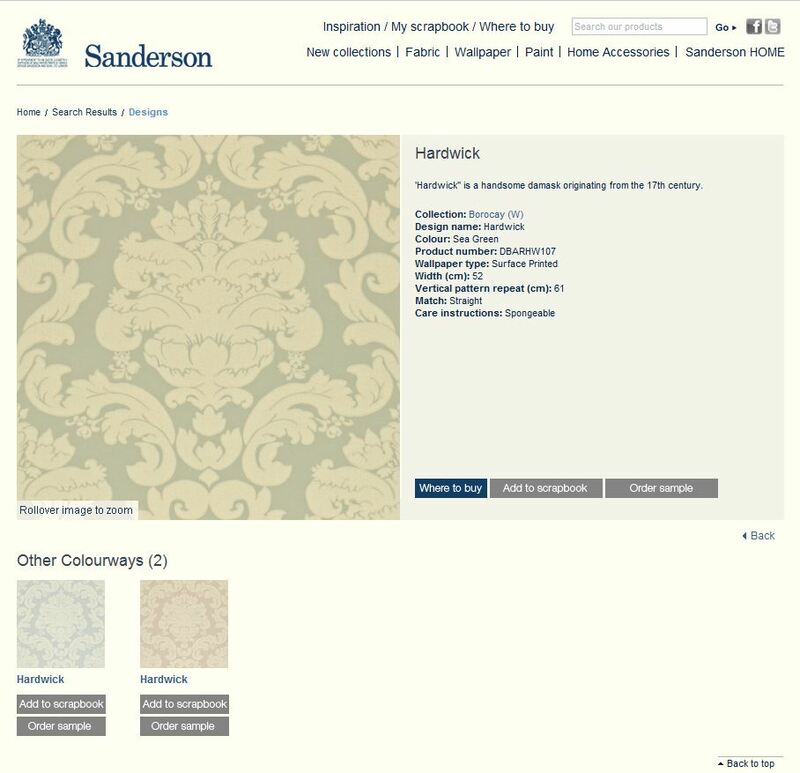 For example the established company Sanderson www.sanderson-uk.com displays some of its patterns as cropped tiles which just need to be right-clicked to save. An example of one of these is below, an attractive damask-derived pattern originating in the 17th century. This pattern image joins up horizontally but not vertically. It’s been extended top and bottom to make it into a square for display and the actual pattern tile is more like a long rectangle. 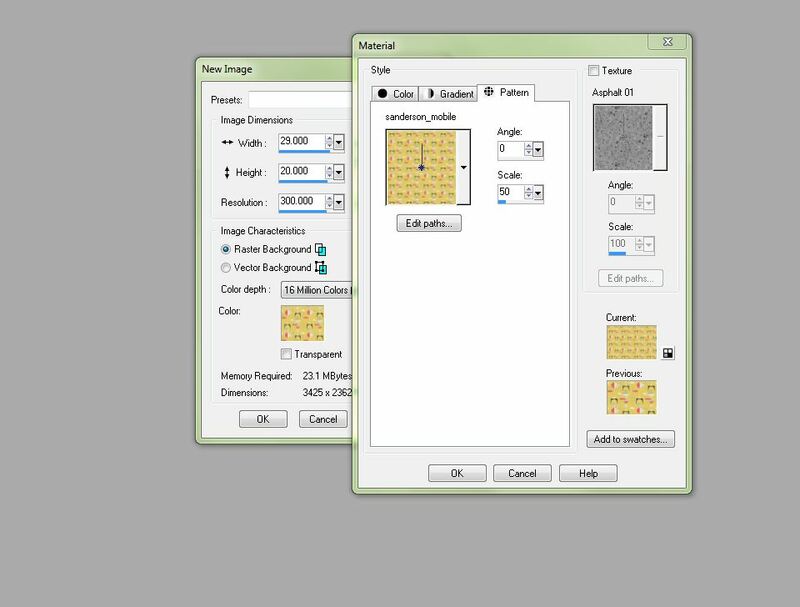 Of course it’s no real hardship to have to crop the image oneself, but it certainly makes the work easier if one can start with the correct tile, which is where the ‘Save background as’ command comes in very useful, as described now. 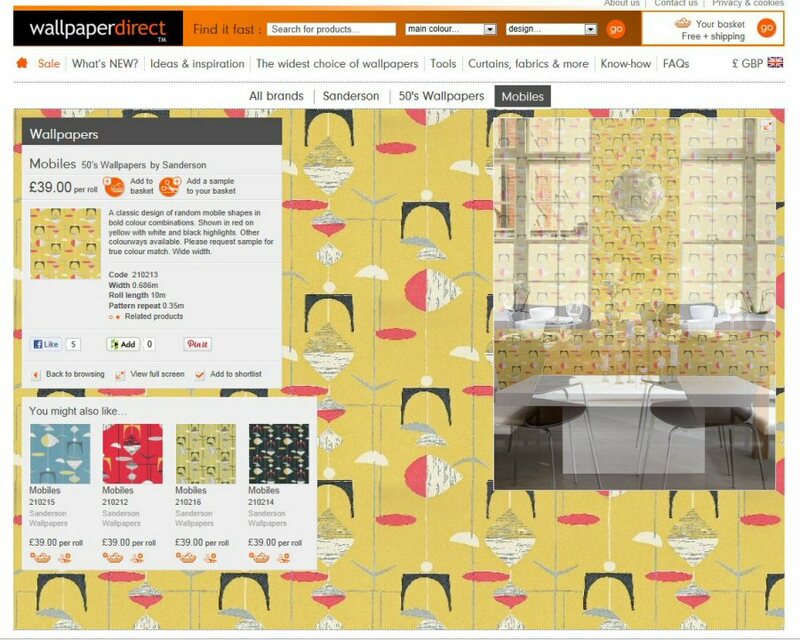 Here I’m using another website as an example, www.wallpaperdirect.co.uk which I also often recommend. I haven’t visited so many others for comparison but this site seems to offer a very good range of both traditional and modern patterns. 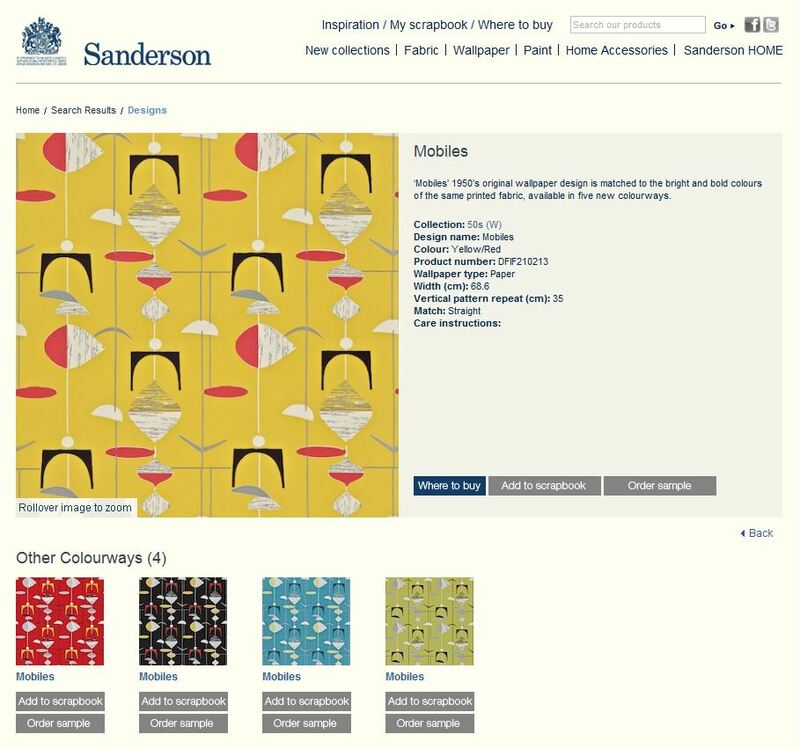 Luckily I found the same wallpaper from Sanderson there and here is the display page for the ‘Mobiles’ range. The arrangement here is different; there are no immediately obvious pattern portions to simply click, instead the wallpaper pattern is displayed here as a background to the webpage, not uncommon in sites like these. As well as the fact that the room photos are very useful in judging the effect of the pattern from a distance, one is offered a larger, uninterrupted field of pattern by clicking ‘View full screen’. But if you do use Internet Explorer you may still have to make an adjustment. Sometimes when right-clicking over background areas of webpages the ‘Save background as..’ is greyed-out along with some other commands. It may just be that the area is not actually tiled such as a regular image or piece of graphic, but it could also have something to do with compatibility between the browser and the webpage. In the ‘Tools’ menu at the top of the browser go to ‘Compatibility View Settings’ and either tick the box to display all websites in compatibility view or enter the current website address in the displayed box. 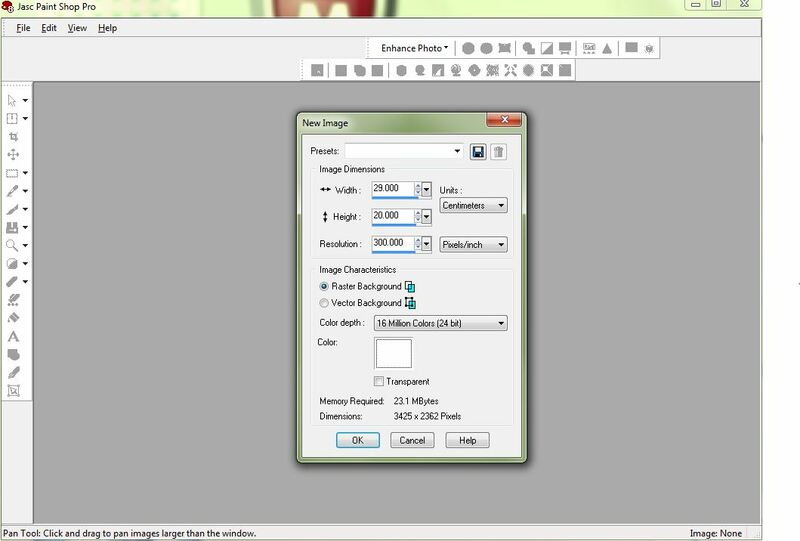 Above is the small image obtained by using the ‘Save background as..’ command. 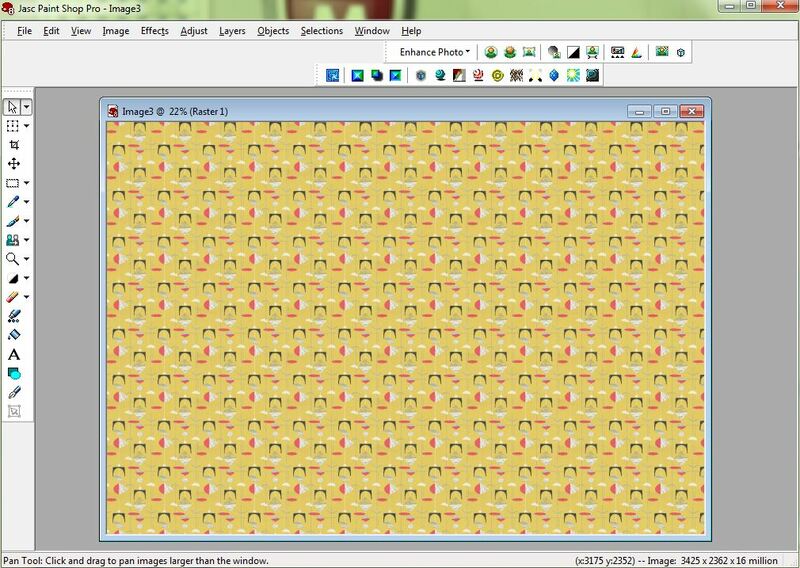 This is what your image software needs to create an area of seamless tiling. 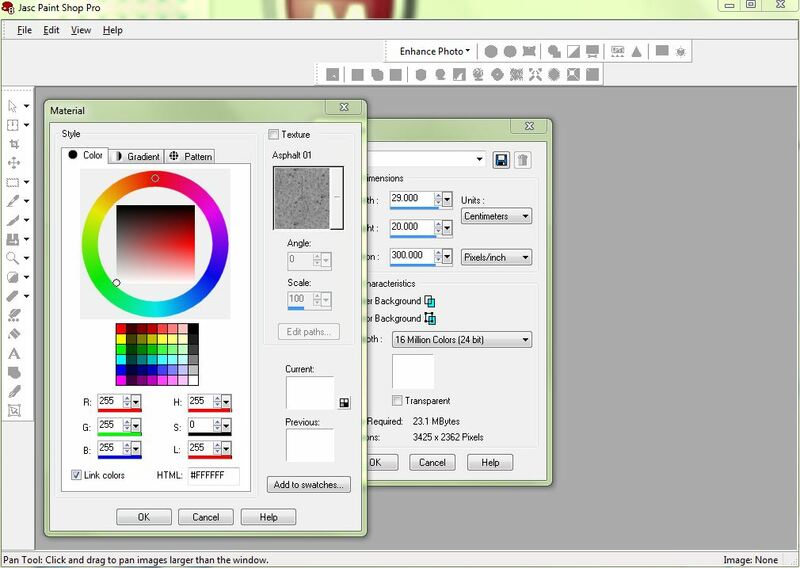 I use Paint Shop Pro, and I’m still using quite an old version (Paint Shop Pro 8) but it does almost everything I’ve wanted it to do so far and I didn’t have to pay much for it. First of all the tile image needs to be put into the programme. 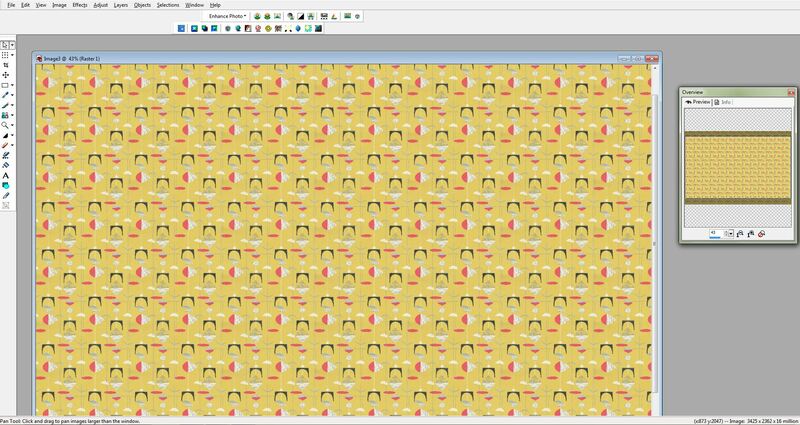 Paint Shop Pro has a ‘Patterns’ folder for this purpose and I’ve found it easier just to find that folder via ‘C:/Program Files/..’ and paste it there. Make sure that you rename the file to something you can more easily find in an alphabetical list because it can otherwise get lost in a large collection of pattern options that come with the programme. 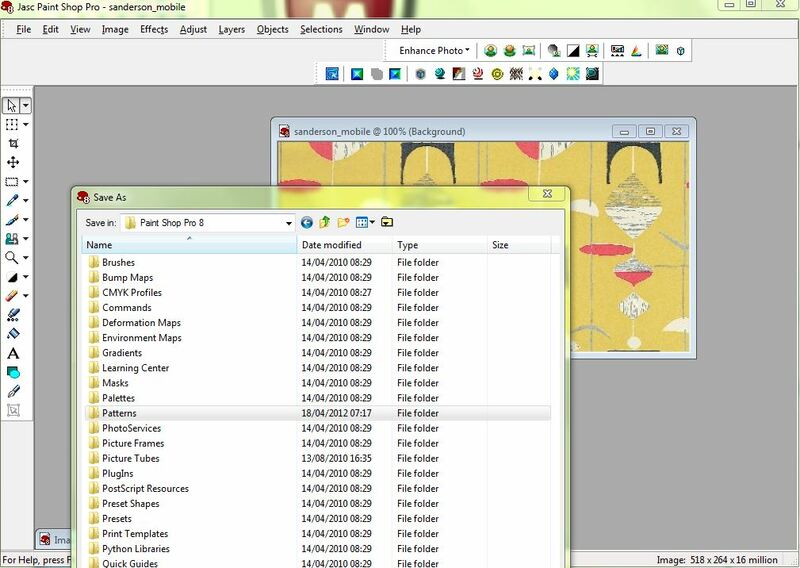 The alternative is to open the file using the software programme and then use ‘Save as’ to navigate to the programme’s ‘Patterns’ folder, as below. The next stage is to open the software programme (if you haven’t already) and start creating a test field i.e. a new file with a certain size. 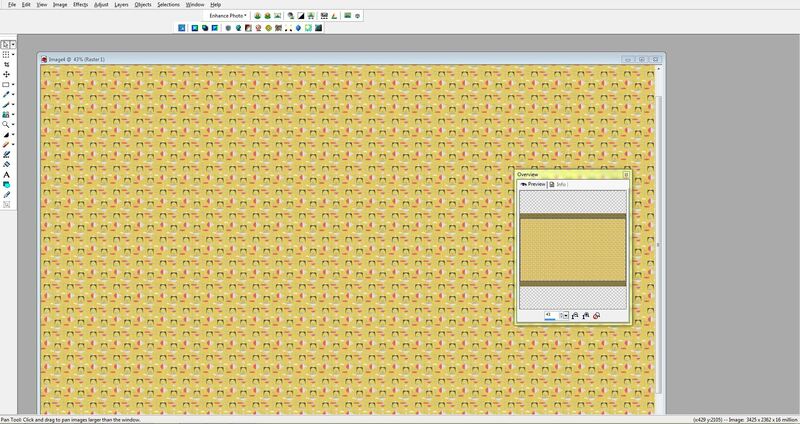 The size depends on how large your viewscreen is, because in order to test the scale of the pattern you’ll need to enlarge this field to approximate to real, printed size on your screen. Since I’ve opted for quite a large viewscreen at home I set the new image file to full A4 size here, but it would be enough to set something like a 15x15cm field initially. 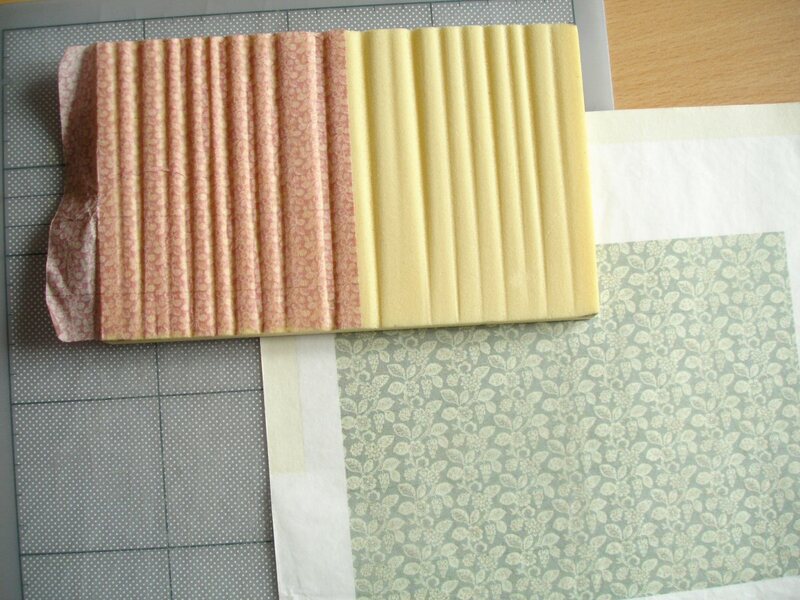 Later, once the right scaling of the pattern has been established, the field can be changed to A4 size for printing. You’re not finished with this box yet (don’t click on ‘OK’ just to see the size of the blank field because it’s difficult to get back to it). I usually set the resolution first to 300dpi (if it’s set smaller the patterns often start too large) and that’s the resolution I want the printer to use. Then you need to right-click on the ‘Color’ box, which will open (what this programme calls) the ‘Materials’ window in which you can choose colours, textures or patterns. By default it will start on the ‘Color’ page, or go straight to ‘Pattern’ if that was your last use. 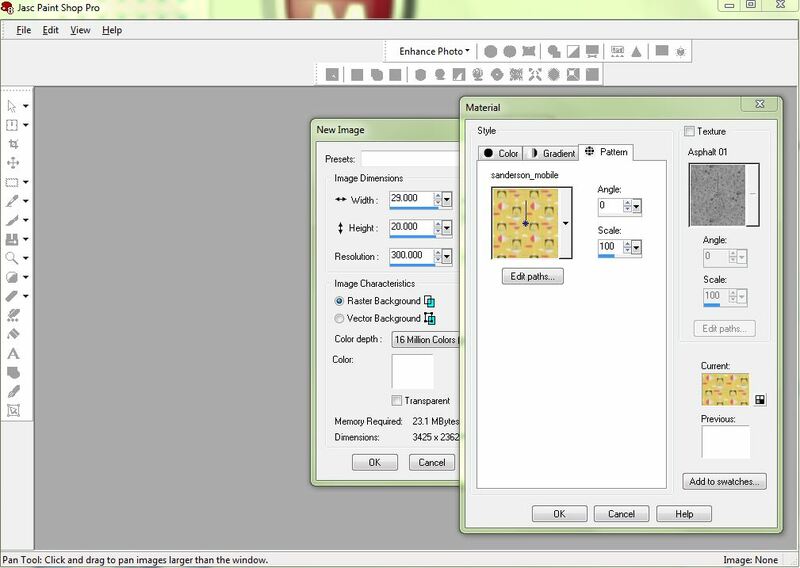 On this ‘Pattern’ page make sure you’ve unchecked the ‘Texture’ box at the top-right, otherwise it will overlay a texture on your test image. Also set the scale of the pattern to 100 for the moment. Then use the arrow on the side of the small pattern window to scroll down the available patterns and select your stored pattern tile. 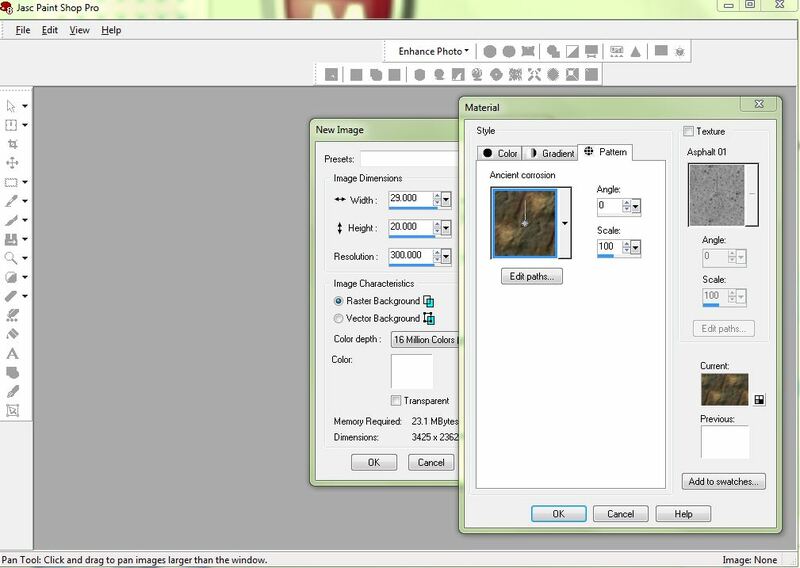 Clicking ‘OK’ on the Material tool will dismiss it, followed by clicking ‘OK’ on the ‘New Image’ window. You will now see the field size you chose filled with the selected pattern at 300dpi resolution and (for the moment) 100% scale. 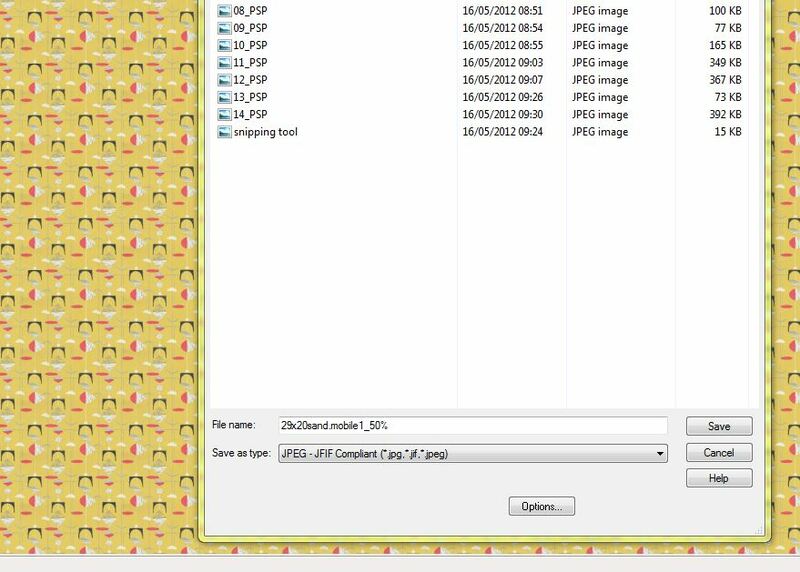 The image now needs to be adjusted on the screen to approximate the measurements entered i.e. the printed size and this can either be done roughly using the mouse scroll wheel or, as below, more accurately in small amounts using the ‘Overview’ tool. The full image isn’t needed on the screen, just as long as there’s at least one measureable side. In this case I felt that the pattern was too big for 1:25 scale so (remembering that the ‘New Image’ and ‘Material’ windows retain all the last settings) I opened a new image and changed the scale to 50. If you’ve done all this (and changed the area to fill an A4 sheet) you are now ready to print, but of course there are many different options for printing i.e. the print quality you select and the type of paper used. 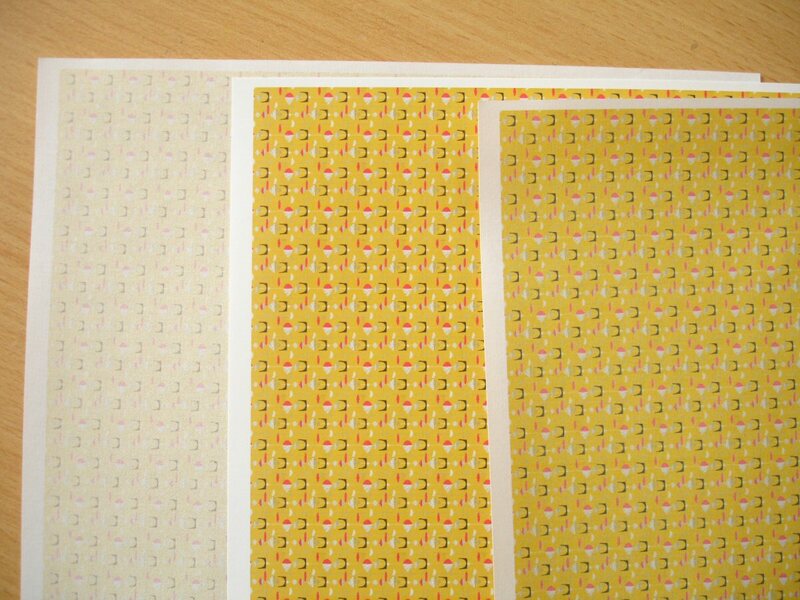 The photo below compares the pattern printed in ‘Draft’ setting on standard copy paper at the left with a print on matte photo paper in the middle and a ‘Photo’ setting on standard copy paper to the right. Obviously the best definition, colour intensity and contrast is provided by a ‘Photo’ print setting using matte photo paper but this doesn’t mean that it gives the best results in a model. Below is a sample of pattern printed on tissue-paper which I’ve then spraymounted onto a piece of Kapa-line foam which has been sanded to suggest folds. This is just one way of simulating curtains or draperies. Tissue-paper is not designed to take ink so the pattern loses some intensity but at least it’s a way of transferring the basic structure of a pattern onto a relief surface. Colours can always be revived with a little painting. There is a little preparation involved in printing on very thin surfaces as they won’t go smoothly through the printer on their own. Below, I’ve had to cut a piece of tissue-paper (I used the ordinary kind sold in stationers for gift wrapping) to exactly A4 size and secured to a backing sheet of regular copy paper. The blue dotted lines indicate where the tissue- paper has been fixed to the copy paper with double-sided tape, along the leading edge when fed through the printer but also a little way up on either side. This extra is necessary because the printer grabs the sheet a little way up from the leading edge so without it the tissue paper would ruck.